For those of you who cannot get enough deep sea diving, our tour provides the perfect opportunity to satisfy your cravings. With this tour, you will spend an entire day in The Bahamas exploring dazzling coral reefs, impressive sunken wrecks and monumental undersea walls. Start your morning by crawling along a massive, deep sea wall, most of which begin at a depth of 40 feet, even though there are some that begin even further below the surface of the water. Because there are so many different things to see along one of these walls, each diver is assured a one-of-a-kind outing. We happily accommodate the desires of our clients and, if you want, you may accompany one of our expert guides to a depth of 80 feet for thirty minutes. After exploring a wall, move on to a wreck or shallow reef site. 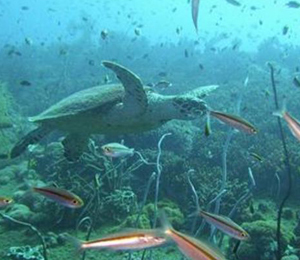 There are a multitude of reef formations to explore around Nassau and Paradise Island, most of which boast a spectacular array of coral gardens and a diverse display of aquatic creatures. Nor will you find a shortage of wreck sites. Some of the more impressive include a 100-foot freighter which lies 50 feet under water, the famous James bond wreck which nests 40 below sea level, and the Cessna which can be seen in the movie Jaws. Our operations owners, Stuart and Michelle Cove, have both worked on numerous films. Your dive locations will be chosen by our expert staff on the day of your journey, which allows them to plan the ideal trip based on the weather and your own desires. A brief lunch is available for purchase after you get back from your morning dive. After lunch, you will head back out for another visit to a wall and either a reef or wreck site. I have been to the Bahamas many times, but Stuart Cove All Day Dive is one of my favorite trips! It includes everything that everyone should do here. As a Bahamas veteran, I can say only the best about this experience!